Lake Tahoe is not an ancient volcanic caldera like Crater Lake. It was formed by the movement of fault blocks. In addition to fractures in the Earth's crust, today's Lake Tahoe Basin was shaped by glaciers and is enclosed by the Sierra Nevada to its west and the Carson Range to its east. Politically speaking, Lake Tahoe is in both Nevada and California, with about one third being in Nevada (east shore and half the north shore). Washoe, Carson City, and Douglas Counties share the Nevada portion. From Reno and Sparks, access to the north shore at Incline Village is on the Mt. Rose Highway (Nevada 431). Forests in the Lake Tahoe Basin were literally clear-cut during the Comstock mining boom. From its initial discovery in 1859 till things slowed down toward the end of the century, timber for shoring up the mines and for fuel was shipped to the Comstock as fast as it could be cut. Once the destruction was halted, the forest came back to what we see today. Approach driving around the Lake (that's how locals refer to Tahoe, like San Francisco is the City) as a leisurely tour. We're talking narrow and twisty mountain roads, steep drop-offs, and lots of traffic during the summer tourist season. There are, however, plenty of places to stop and enjoy the view, take a hike, or have a picnic. Much of the shoreline is public (though not all), with parks, beaches, swimming areas, and other attractions. It's 72 miles around and takes three hours if you don't do anything but drive. Since no one can do that, plan on a whole day to really enjoy a place like no other. There are five main roads up to the Lake. We will start the tour by taking the Mt. Rose Highway (Nevada 431) from its intersection with S. Virginia Street (by the Summit Sierra mall) up to Incline Village. It's about 35 miles from Reno. Visiting the Lake Tahoe area is lots more fun if you do something special. Here are some tours and activities to make your Lake Tahoe sojourn a truly memorable experience. At the intersection in Incline Village, turn right onto highway 28. At Crystal Bay, you cross the state line and enter Kings Beach, CA, then motor through Tahoe Vista, Carnelian Bay and arrive at Tahoe City. The drive from Incline Village to Tahoe City is about 15 miles. This is a developed area with lots of private shorelines, though there is public access to the water at spots like Kings Beach Recreation Area. If you want to bail out, U.S. 89 at Tahoe City goes north to Squaw Valley, Truckee, and I80. California 267 from Kings Beach also goes to Truckee. Continue south from Tahoe City 18 miles to Emerald Bay. You will pass through Homewood, Tahoma, and Meeks Bay. As you approach Emerald Bay, the road becomes more twisty and hugs the mountainside above the Lake. Stop at one of several parking areas around Emerald Bay for one of the most spectacular vistas anywhere on this drive. The area around Emerald Bay is a state park with camping and hiking. You can walk down to lake level and tour Vikingsholm, a former private estate built as a reproduction of what rich Vikings would have had. I've done the tour and it's worth the time. The road around Emerald Bay is really steep and has a number of hairpin turns. Take it easy here and watch for wandering tourists looking at the views and not looking for traffic. Back down by the Lake, you will come to a private campground/resort at Camp Richardson and shortly thereafter enter the city of South Lake Tahoe. At the intersection, locals call the Y, turn left onto U.S. 50 (Lake Tahoe Blvd.). If you turn right, 50 will take you over the Sierra at Echo Summit and all the way to Sacramento. Head east on the long strip through town, eventually arriving at Stateline, NV. You will see the hotels and casinos long before you get there, beacons urging you back into Nevada. You have come 15 miles from Emerald Bay. If you want to leave the Lake Tahoe Basin at this point, turn right at the Kingsbury Grade (Nevada 207) about a mile past the casinos. This route hairpins up to the Sierra crest then plunges down the east side to Minden and Gardnerville in the Carson Valley. It's steep on both sides and not recommended if you are pulling a trailer or driving a big motorhome. Stateline to Spooner Junction is a slow 13 miles. From the Y it's been a four-lane road, but traffic is heavy and you pass through the Lake's most populated and congested area. North of Stateline, Zephyr Cove is a busy resort area with camping, public lake access, and is home port to the M.S. Dixie II paddle wheeler. Further north at Glenbrook, U.S. 50 turns east away from the Lake and climbs to Spooner Junction, the intersection with Nevada 28. From Spooner Junction, it is 14 miles to Carson City and the junction with U.S. 395 if you stay on U.S. 50. Turn left onto 28 to continue 12 miles along the lakeshore to Incline Village. You will be back on a two-lane road that winds through the woods and has limited places to stop. Just after getting on 28, look for a right turn into Lake Tahoe Nevada State Park (more information below) if you'd like to rest and perhaps take an easy stroll around Spooner Lake. There is also a trailhead for the more vigorous hike to Marlette Lake and access to the famous Flume Trail for mountain bikers. A bit further on is Sand Harbor, part of the state park and site of the Lake Tahoe Shakespeare Festival. Next stop is Incline Village and the return trip to Reno on the Mt. Rose Highway. Of course, my tour barely touches on all there is to see and do in the Lake Tahoe Basin. Use this as a start and you will discover numerous wonders in this unique Sierra Nevada environment. Around Tahoe is a self-guided tour app or CD you can use to accompany a visit to the Lake Tahoe Basin. They are narrated by local singer/songwriter Darin Talbot, a Tahoe resident since 1977. You have two choices for the CDs: a driving or skiing tour. 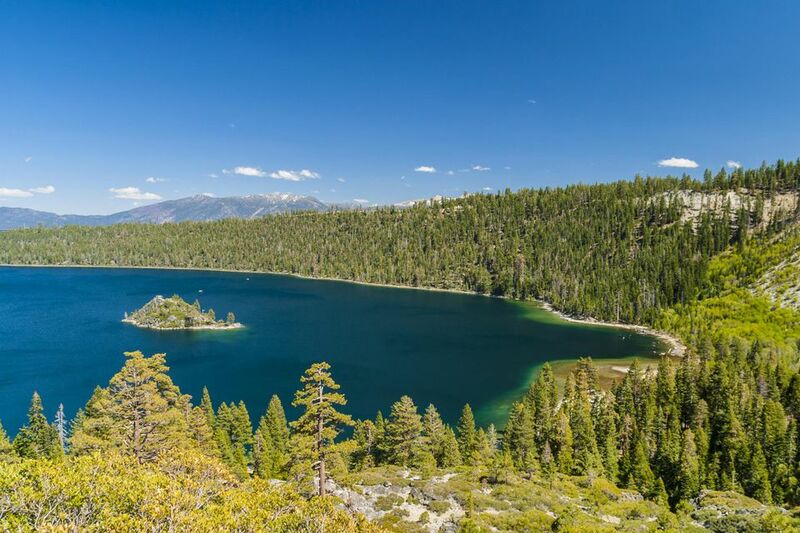 They feature interactive maps, histories, and legends of Lake Tahoe, GPS coordinates, cool spots to visit, museums, dog-friendly beaches, 20 songs about Lake Tahoe, and more. You can purchase the CDs online, either as CDs to be mailed or as an MP3 download with accompanying booklet in .pdf format. It's also available at the North Lake Tahoe Visitors Center in Incline Village and in some stores around the Lake. Perhaps the best and most diverse park in our Nevada system is Lake Tahoe Nevada, State Park. Two distinct units within this park offer visitors a choice of what to do, see, and enjoy. Check these out and you will find something for everyone in Lake Tahoe Nevada State Park... Sand Harbor and Marlette-Hobart Backcountry. Surface Area: 191 sq. mi. Maximum Surface Elevation Above Sea Level: 6,229 ft.
Volume: 122 million acre ft., 39 trillion gal. Lake bottom is 4,580 ft. above sea level, lower than Carson City. Water Clarity: 67.7 ft. in 2006, measured by the Secchi depth reading method (down from 100 ft. since readings began in the late 1960s). Numerous streams flow into Lake Tahoe, but its only outlet is the Truckee River. Sources: USGS Lake Tahoe Data Clearinghouse and VirtualTahoe.com.